If you are on a California highway this summer and glance up to a giant white truck with “Otto” stenciled on its side, don’t be alarmed if the driver isn’t touching the steering wheel – the robot has the controls. It is a test big rig from Otto, a company launched by two Silicon Valley entrepreneurs who are developing self-driving truck technology. The company, founded in January by Anthony Levandowski, a veteran of Google’s autonomous car division, and Lior Ron, previously in charge of Google Maps, is engineering kits that would turn existing trucks into autonomous vehicles. Their vehicles are designed to drive from “exit to exit” on major highways, always with a driver on board to monitor progress and be ready to take over in an emergency. Otto’s technology is intended to improve safety and reduce driver fatigue on long trips, Ron said. 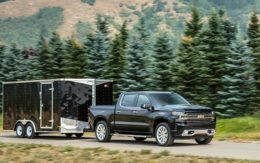 The San Francisco-based company has a fleet of five test trucks and plans to have at least two more ready to hit the highways this year. It’s possible that Otto’s technology will be ready for commercial use in “a couple of years,” he said. For now, it is in the initial test phase of autonomous driving development. Sensors on the truck including radar, lidar — a form of radar only with lasers that are ideal for mapping the Earth — and cameras will help computers paint a digital picture of the vehicle’s surroundings. Software will then determine speed, braking, acceleration and other functions as the truck moves down the highway. Otto is developing the system and figuring out how to essentially put a robotic brain into a truck to transform it into an intelligent vehicle. The cost of the driving kit hasn’t yet been determined. Once the test vehicle phase is complete, Otto plans to install the kit on trucks owned by private fleets or owner-operators so drivers can learn how the technology would affect their driving habits. The goal is for Otto to become a driving assistant for operators who are open to new technologies, Ron said. The company also is looking to place its autonomous technology with fleet operators who would consider adding autonomous driving technology to their vehicles. The key to ensuring the longevity of autonomous trucks is showing that it’s safe, he said. That’s why Otto developers are focused on getting the trucks to drive on highways rather than congested city streets. An open road requires less starting and stopping, generally has less traffic and allows vehicles to travel at higher speeds. “The highway environment is different and much more defined, which makes it easier to solve – not easy to solve but easier to solve,” Ron said. “We can put many more sensors on the truck and we can put them at a higher vantage point so they can see farther down the highway,” he said. Otto is a start-up that so far has been completely self-funded by its founders. They wouldn’t disclose how much they’ve invested. It faces competition from well-established, well-capitalized traditional truck companies including Scania, Daimler and DAF, a subsidiary of Paccar. Daimler last year unveiled its Freightliner Inspiration Truck, based on the Cascadia Evolution series production model. Two of the Inspiration trucks were approved for use on Nevada highways in May 2015, the company said. In 2014, Daimler released its first autonomous vehicle, called the Mercedes-Benz Future Truck, in Europe. The German automaker believes that adding autonomous features to heavy-duty trucks can transform long-haul trucking, relieving driver stress, improving safety and potentially alleviating a chronic industry driver shortage. “Clearly, the job is stressful, often monotonous, and the prospects of promotion are limited,” Daimler said in a statement on its website. Passenger-car companies are already starting to roll out semi-autonomous features in new vehicles. The functions include automatic braking, adaptive cruise control that ensures a car is always a safe distance behind another vehicle and automatic steering that keeps a vehicle centered in a lane. Tesla Motors Chief Executive Elon Musk has pledged that his company would have a fully autonomous electric vehicle on the market by 2019. He also said he would unveil plans for electric trucks and buses next year, saying they also would be autonomous. But already the company’s attempts to make that a reality have faced a few speed bumps, including a crash that killed a Florida man earlier this year when his semi-autonomous Tesla couldn’t “see” a truck that pulled in front of it. That’s why Otto is so focused on safety, Ron said. Without the public’s trust, fleets and owner-operators will be hesitant to put the company’s technology on their vehicles. 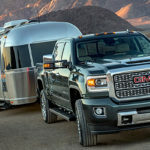 To that end, the company hired two distinct types of people: drivers with decades of experience and more technical-minded individuals who better understand vehicle autonomy. 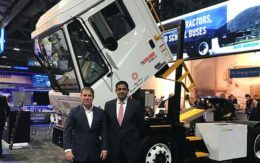 “On any given route we have … two test drivers in the truck, one a very experienced commercial driver with dozens of years of experience and the other with years of working on autonomous vehicles who will understand those types of systems,” Ron said. Still, there are many hurdles blocking the adoption of autonomous truck technologies, said Michael Baudendistel, an analyst at Stifel Financial Corp. Questions about how to insure such a vehicle, how long vehicle-to-vehicle communication technologies will take to develop and how to ensure drivers are attentive should they be forced to suddenly take the wheel remain unanswered. Driver attention is an issue that concerns developers at Otto, Ron said. Although the trucks will be autonomous, they’ll still require a driver who will have to take over in the event of an emergency. How to get the vehicle to take evasive maneuvers, but only when it needs to, remains a major technological conundrum. Ideally, a driver would take over before such a move is necessary, he said. Otto is working feverishly to quickly develop its technology so it can get commercial-ready units available as soon as possible, he said, but ensuring the quality and the safety takes time. In the meantime, the company will continue to add to its stable of test trucks. “We really want to bring the technology to the market as fast as possible, but we need to do it in a safe way,” Ron said.